Gold and silver futures moved within a narrow range in their start to the new trading week on Monday, both logging modest gains. Gold for December delivery rose $1.10, or less than 0.1%, to settle at $1,256.60 an ounce on the Comex division of the New York Mercantile Exchange. "It’s mainly dollar weakness that’s putting a little bit of a bid under the market," Reuters quoted Phillips Streible, senior commodities broker for RJO Futures in Chicago. 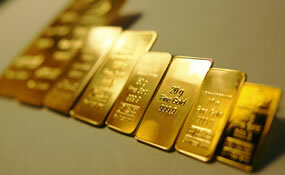 Gold futures ranged from a low of $1,251.10 to a high of $1,258.20. They climbed 0.3% last week, their first weekly gain in three weeks. Snapping a four-session losing streak, silver for December turned up 3.3 cents, or 0.2%, to settle at $17.474 an ounce. Silver futures traded between $17.36 and $17.52. They advanced last week by 0.4%. January platinum shed $3.30, or 0.4%, to $936.20 an ounce, ranging from $929.40 and $944.80. Palladium for December delivery fell $10.50, or 1.6%, to $637.80 an ounce, trading between $634.55 and $655.25. The two metals last week posted declined of 2.4% and 2.9%. Gold rose $3.05, or 0.2%, to $1,254.80 an ounce. Silver dipped 7 cents, or 0.4%, to $17.40 an ounce. Last week, London silver prices gained 0.8% while the other metal prices registered losses of 0.6% for gold, 4.3% for platinum and 4.7% for palladium. In a rarity for any given day, nearly every U.S. Mint bullion product scored gains on Monday. Combined advances included 12,500 ounces in gold coins and 679,000 ounces in silver coins. Below is a sales breakdown of U.S. Mint bullion coins with columns listing the number of bullion coins sold during varying periods Products with an asterisk (*) are no longer available. I have a feeling that platinum is being horded by major mints. I know it is scarce compared to silver and gold but the amount of bullion minted annual is scary at best. The U.S. Mint is definitely buying up platinum big time since next year is the 20th anniversary of the Platinum American Eagle coin program (the coins are produced in bullion version & Proof versions of 1-ounce .9995 fine platinum). Plus, the US Mint recently announced it will start a 3-year program the next year in 2018 for Proof Platinum Eagles coins with a theme of “Life, Liberty & the Pursuit of Happiness”. This will all create more demand for platinum here in the US for the next 4 years. Platinum is really cheap compared to gold now & a platinum shortage towards the end of this year is expected by most platinum analysts I have read. Anytime platinum is under $1000 an ounce, I buy a 1-ounce bullion version each month. For years platinum was higher than gold. I think I will to start stacking platinum. Buying a one ounce bullion coin monthly sounds like a good idea to me. It will be a nice change to stacking silver and gold.